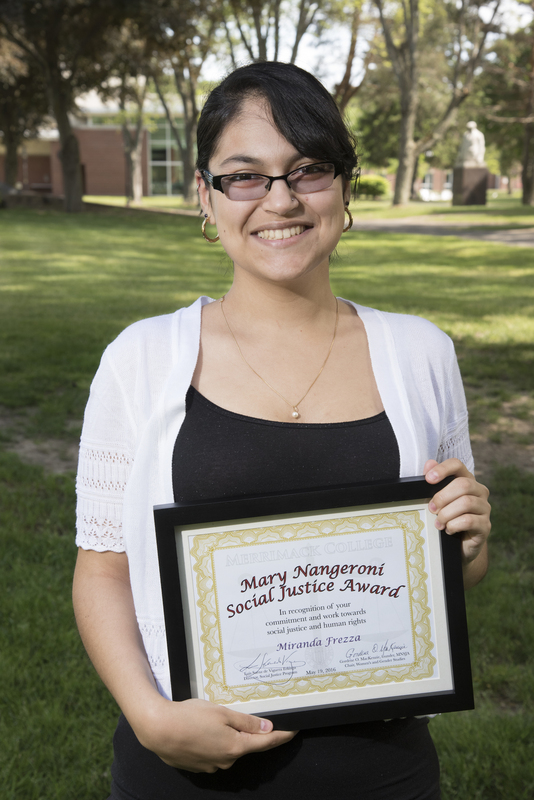 We are pleased to announce the selection of Rubylus Vazquez and Naudia Mason as recipients of the 2017 Mary Nangeroni Social Justice Award at Merrimack College. 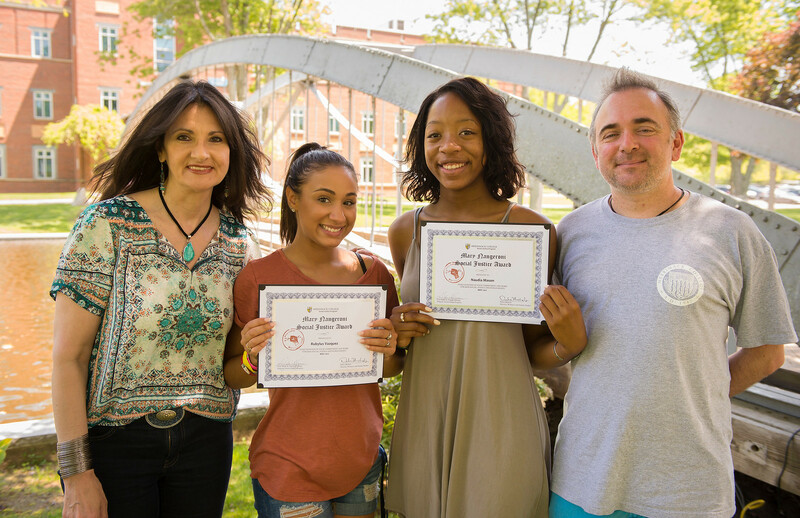 Rubylus and Naudia were honored at a luncheon by Women's and Gender Studies Director Dr. Debra Michaels, and Social Justice Director Dr. Luis de Viguera Erkiaga Saenz. We are pleased and excited to announce the first-ever recipients of the Mary Nangeroni Social Justice Awards! Noelia Figuereo, Bella Lopez and Stephanie McNally, students at Merrimack College in North Andover, are being honored for their "demonstrated commitment to, and work in, the area of social justice and/or global human rights.” They received their awards at a luncheon on May 12 from Gordene O. MacKenzie (chair, Women’s and Gender Studies and Social Justice program co-founder), Professor Luis Saenz de Viguera Erkiaga (also a co-founder, and the Program's director) and Nancy Nangeroni (daughter of Mary Nangeroni and Chair Emeritus, MA Transgender Political Coalition). 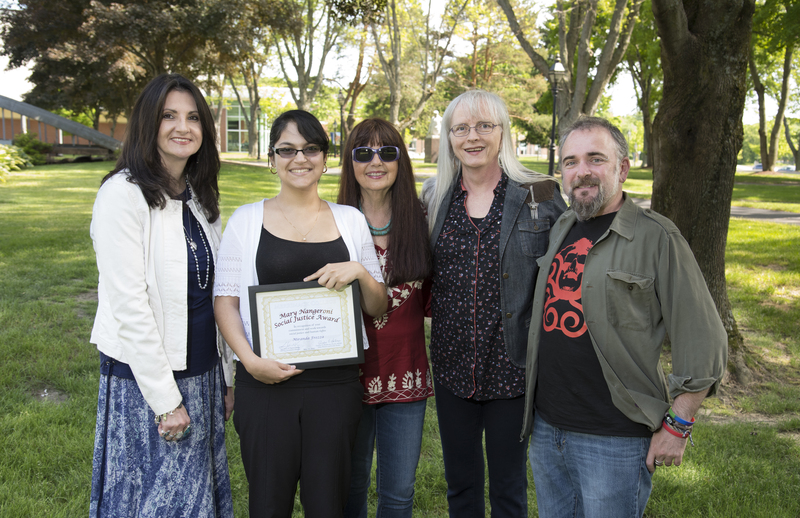 The recipients were given certificates and checks for $200 each. 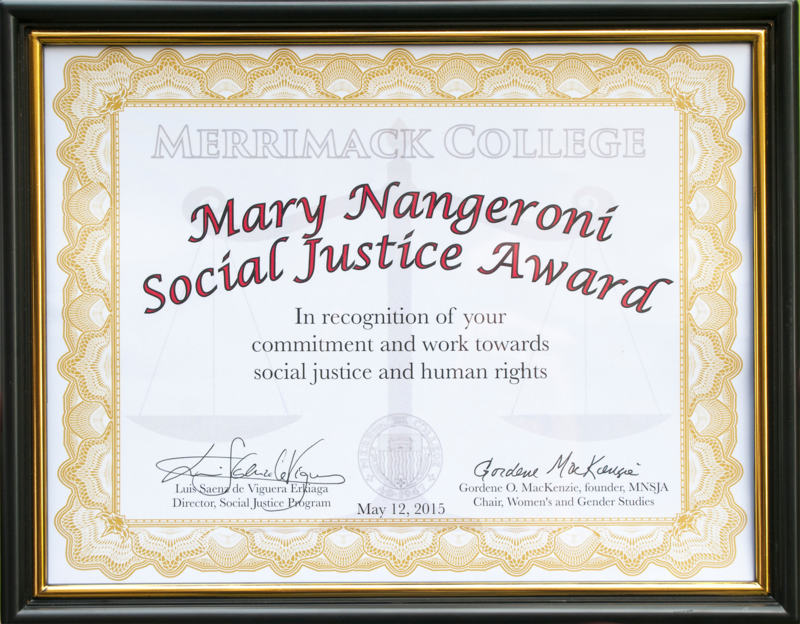 The Mary Nangeroni Social Justice Award is an ongoing program of grants for young people to study and involve themselves in social justice, while keeping alive the best of the spirit of Mary Nangeroni. The award nominees each wrote a reflection paper about the work they’re doing and their future plans. 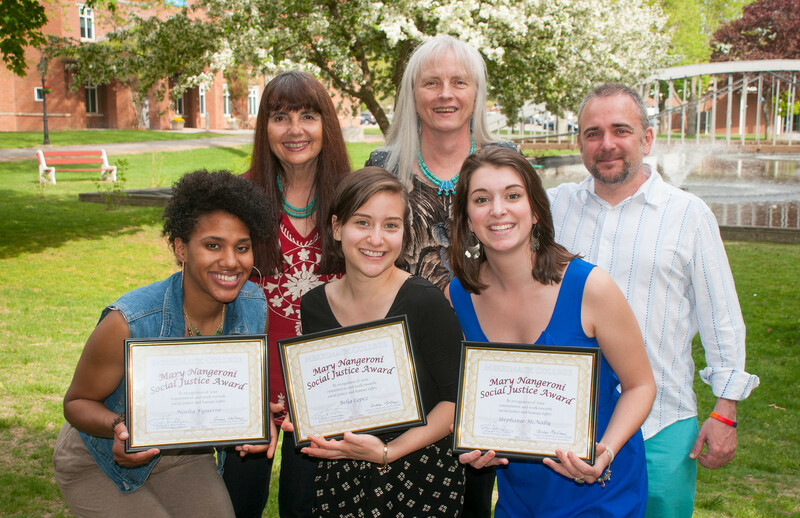 Mary was a tireless volunteer committed to helping end racism, domestic violence, poverty and other inequalities. She helped form, and served a term as president of, the Milton Civil Rights Fellowship. She served as board president of the Metropolitan Council for Educational Opportunity (METCO) program, Boston’s voluntary school desegregation program. She also volunteered at Freedom House. 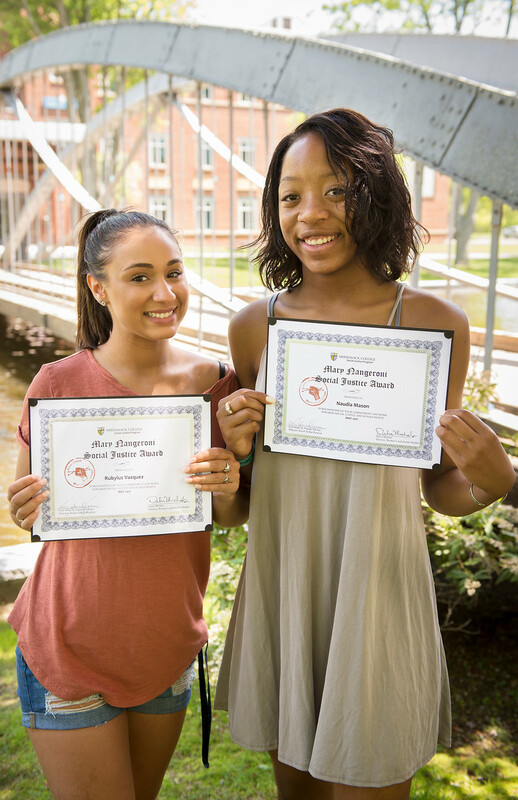 In the summer she brought carloads of kids from Dorchester and Roxbury to her house to swim in the pool. She also volunteered at Rosie’s Place (a sanctuary for poor and homeless women) and DOVE, an organization dedicated to ending domestic violence. She was a founder of the Milton Meals on Wheels program dedicated to ending hunger for seniors. She volunteered with Hospice and often gave caretakers a day off by sitting with those who were ill and dying. She served as an organist and choir director for several churches. She was recognized for her exceptional volunteer work at Milton Hospital where she led weekly sing-alongs and did other volunteer work for more than 20 years. She also helped form Milton’s branch of the No Place for Hate program. The fund was established in 2014 by Gordene MacKenzie and Nancy Nangeroni, who have been life partners since 1998.